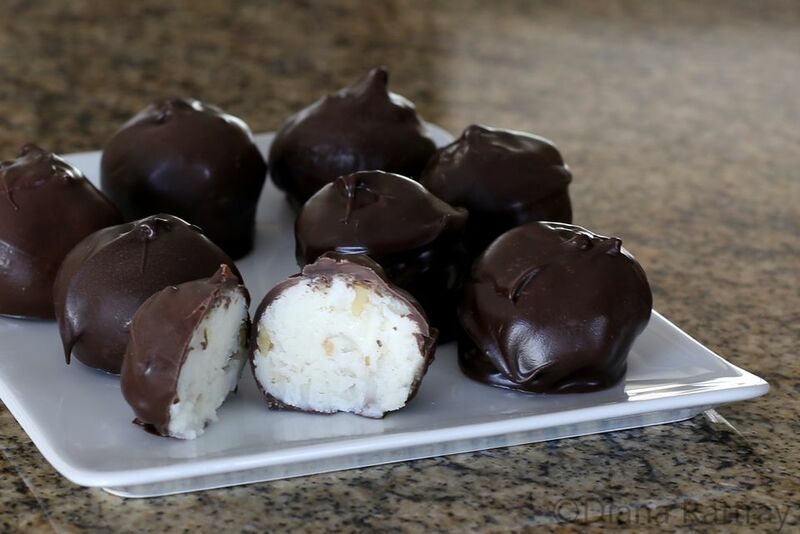 These chocolate-coated Martha Washington candies are very easy to make and everyone will love them! The creamy coconut pecan filling is simply a mixture of sweetened condensed milk, coconut, pecans, and powdered sugar. Use chocolate chips or specialty dipping chocolate or almond bark to coat the candy. Line a baking pan or tray with wax paper or parchment paper. Sift the confectioners' sugar into a large bowl; add the sweetened condensed milk, coconut, melted butter, and pecans. With your hands, shape the mixture into balls and place on the pan or tray. Refrigerate the candy until the balls are very firm. Melt the wax and milk chocolate chips together in double boiler. Dip the chilled balls in dipping chocolate and let cool. Store the candy in an airtight container in the refrigerator. Replace the wax and chocolate chip mixture with 1 pound of almond bark or candy melts for the chocolate coating. Melt as directed and dip the candy to coat thoroughly.